This post is a precursor to a one arm handstand tutorial I’ll write in the distant future. In this post, I want to take you through my one arm handstand over the years. Some of it is good, some of it is horrendously terrible, but throughout it all I hope you learn something. A bit of background – I never did gymnastics as a kid. My younger days were spent playing baseball, soccer, and riding my bike around the neighborhood. It wasn’t until I was around the middle of high school, when I was about 16 years old, that I even starting playing around with this stuff. A friend’s uncle would tell us stories of his days on a gymnastic troupe – of doing handstands on chairs, and fingertip pull-ups off door frames. 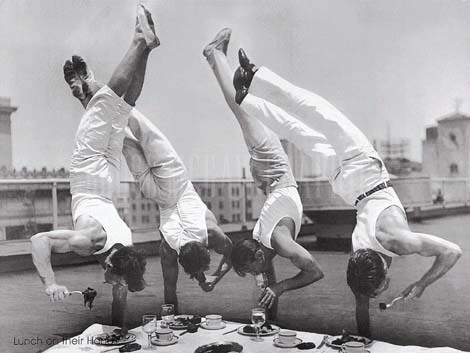 Those stories, and the handstand training we started that summer, would irrevocably change my life forever. I couldn’t tell you exactly how my friend and I first learned the handstand. Or what specific progressions we took, but I will tell you that I practiced like a man obsessed. In my tiny bedroom – often bringing my foot down onto my nightstand and falling into a heap on the floor. Out in the backyard – stumbling around on my hands to find balance. 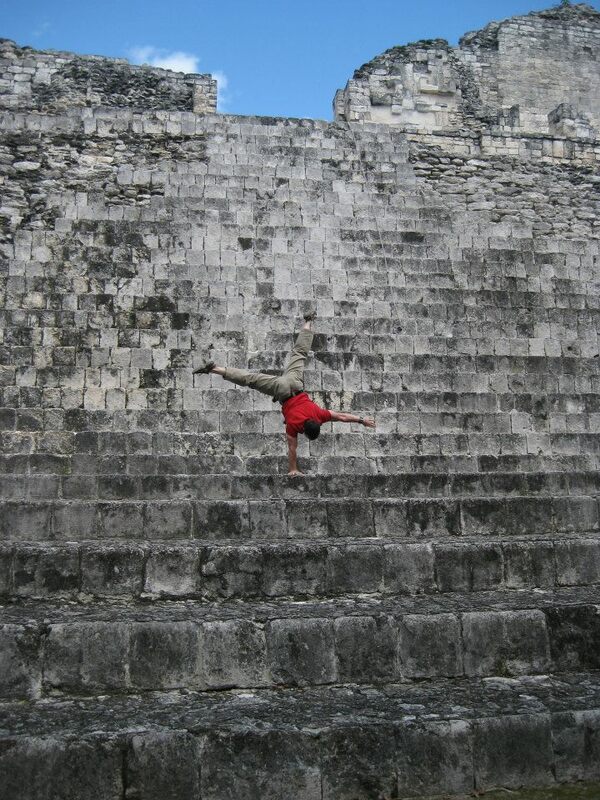 Anywhere I could manage, I practiced my handstand. I didn’t wait for perfect conditions and knowledgeable teachers, I just put in a lot of brute force work. My friend and I continued to work on our handstands – even challenging each other to press into a handstand (one of my first skills). I continued working handstand pushups up against my bunk bed in my bedroom. 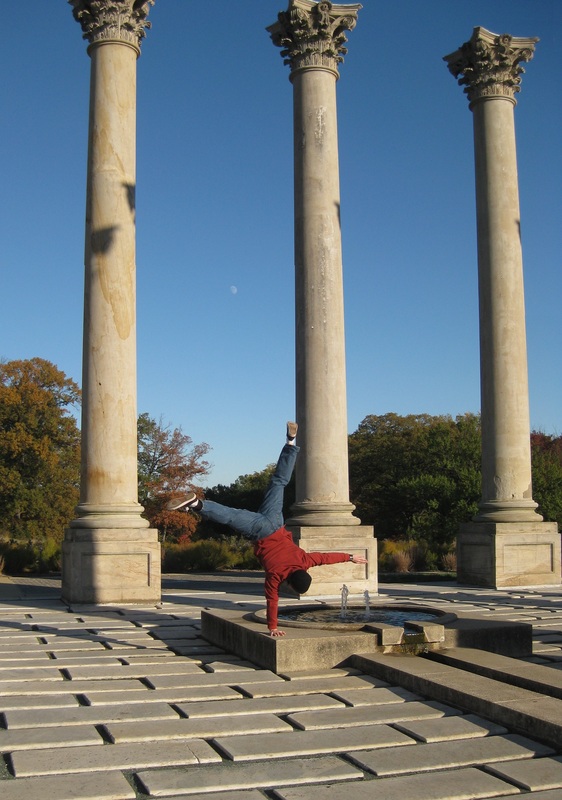 Several years later, by the time I joined my own gymnastics troupe, I was able to hold a solid handstand and do freestanding handstand pushups. I even managed to win a handstand holding contest my first day on the troupe! I can’t tell you when the one arm handstand bug bit me, but it feels like I’ve been working the skill for ages. I still have plenty of work to do, but I’m happy with the progress I’ve made and grateful for the journey – however long and winding it has been. I’m going to post up pictures and just briefly describe the technique/lack thereof for each one. This isn’t a step-by-step tutorial, but I hope that by pointing out my countless mistakes, it helps you in your practice. I also enjoy looking back on all the memories. 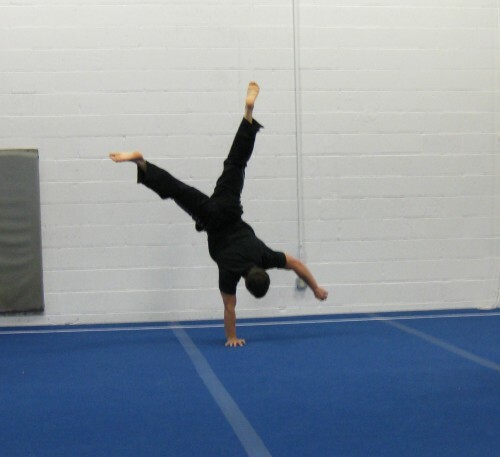 I’ll also note that there are many one arm handstand styles. You’ll be taking a look into mine, but I do not have the final say on this by any means! Alright, onto the one armers! 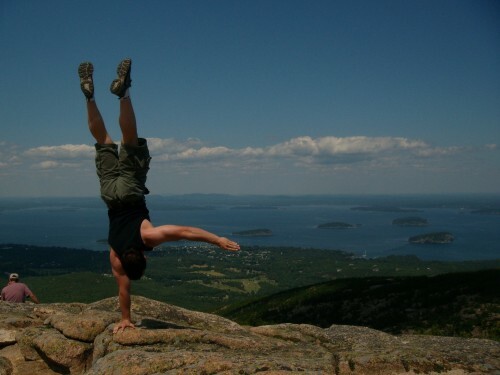 This was taken by my good buddy Alex on an awesome trip to Acadia National Park. The excellent background distracts from my less than excellent technique. Let’s start from the ground and work our way up. – Supporting arm is locked and the shoulder is right over my hand. This is all good. – Head – I am trying to put my ear directly next to my supporting arm – like I’m looking down the barrel of a gun – which was not the best technique for me. A bit of natural space between the head and arm, as opposed to trying to force it over, has worked much better for me. – Free arm is way off to the side and most likely brought off the ground way too quickly. Throwing that free arm up too quickly would send me cartwheeling out of my one arm handstand for years. Pick it up slowly when you first start! – Body is in line with the hand because I’ve shifted my head close to my arm. This is not the way I do my one arm handstand now – preferring a slight body lean in order to engage my shoulder and stay balanced. – Legs look a little loose and are clearly arching over a bit. They are not in line with the rest of my body. Trying to hold a one arm handstand with the legs this close is also significantly harder. One should start practicing with the straddle position first. Beautiful photo, but just dumb luck that I was even able to balance in this position. The photo that would live on the front page of Beast Skills for years. I love it for the background and how it looks like I know what I’m doing. Let’s break it down. – Head – I was still convinced that you needed your head directly next to your arm, so I’m doing the same thing here. – Free arm was still “whipped” into place. Allowing momentary balance, but usually throwing me off in practice. 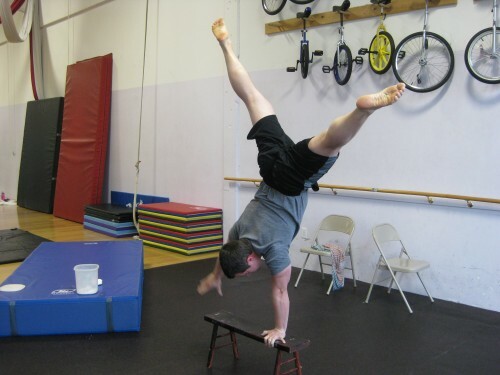 – Straddled legs are a better option and much more forgiving in the one arm handstand, but with the previous head shift, they were not brought into the optimal position. – Legs look a bit arched over – this often threw me out of alignment and caused problems with balance. Looks better than the last photo, but still plenty of things to change! The Grand Canyon is awesome, and I recommend that everyone see it sometime in their life. Pictures don’t convey the enormity of the landscape. This one armer was the closest to the Canyon that my girlfriend (now fiancee) would let me get at the time. – Supporting arm is still upright and strong. This was at least one thing I was getting right. – Free arm – can’t keep that damn thing down! Again, it was probably whipped up into position. – Body – we can see a slight lean, but I can guarantee that was probably not intentional. – Legs – straddled, which is good, but still arched over and out of line. From things I had read, I long believed that one needed to shift their weight forward and to the side in a one arm handstand. In the above photo, that means that I’m trying to aggressively shift my weight to what would be the lower left corner of the photo. The legs are arched over as a result. Don’t do this. Keep the body in line! (More on that below). Cool vacation photo, still plenty to work on though. Another cool looking photo, but issues abound. First, the complete lack of consistency in my attempts. Also, it appears that no one is interested in what I am doing. 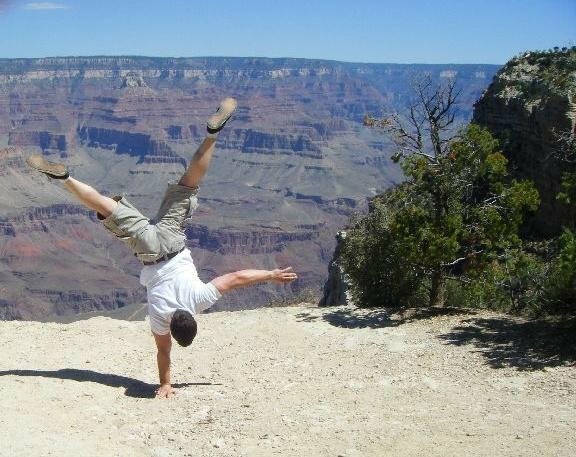 The Grand Canyon is more impressive than a one arm handstand, ‘natch. – Supporting arm – totally vertical, this is still great. – Head – looks like I’m pulling it inward to the supporting arm again. This gives the entire torso a very vertical look to it. – Free arm – still brought up fast. Have I mentioned that one should lift it slowly when first learning?? Love the photo, but hate all the mistakes! I show this two arm handstand to raise a few points. 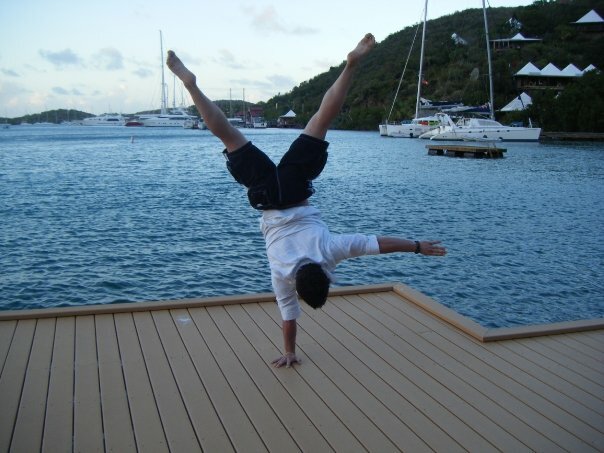 If your handstand is a bit arched like this, then learning the one arm handstand will be problematic. You want to get the entire body in a straight line. This means opening up the shoulders more (through increased flexibility and increased strength) and then bringing the midsection and legs back into a line. 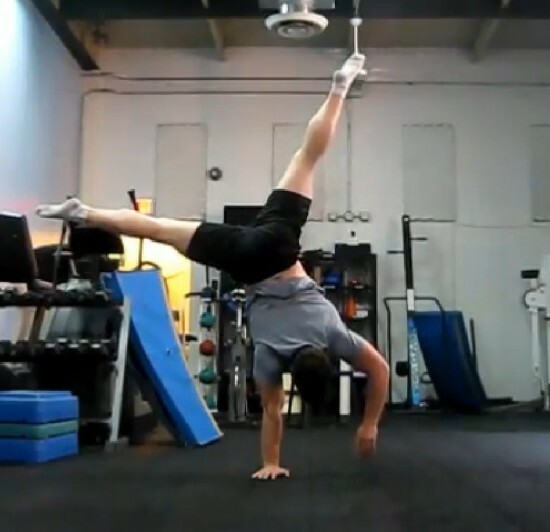 Getting a good line in your two and one arm handstand is a never ending process, but know that the further off-line you are, the more problems you may encounter. All my handstands didn’t look like this, but I hadn’t realized the importance of getting into a line for the one arm handstand yet. This is taken in my own neighborhood! Looks ok on inspection, but let’s look at some new issues. – Head, not pressed up against the supporting arm, which is a good step. – Free arm – not whipped up violently like in the past, but still most likely brought up too fast. The arm does not always need to be ramrod straight either. Lifting up the free arm with the lower arm dangling (as you’ll see in the videos below) can often times afford better balance when first starting. – Legs are straddled, which is good, but you can see how the legs and hips have shifted a bit to my right side (to the left edge of the picture). When shifting the legs now, I focus on dropping the outside leg (my left leg in this photo), and preventing any sort of shift/twist to the right side. So my legs/hips are not in the best position here. I can’t even remember what I was taking this picture for, but I’m glad I have it. Showing the one arm handstand at a seminar in Pennsylvania. Snowed a lot that weekend. – Straddled legs could be straddled wider. I may have been at the limit of my flexibility though. Getting a wide straddle or even full splits will help a lot in learning the one arm handstand. The split legs will drop your center of gravity and allow you to put your hips and legs in a better position. – Legs are definitely arching over. I’m still trying to aggressively shift my weight forward and outside, as I still thought that to be the best technique. 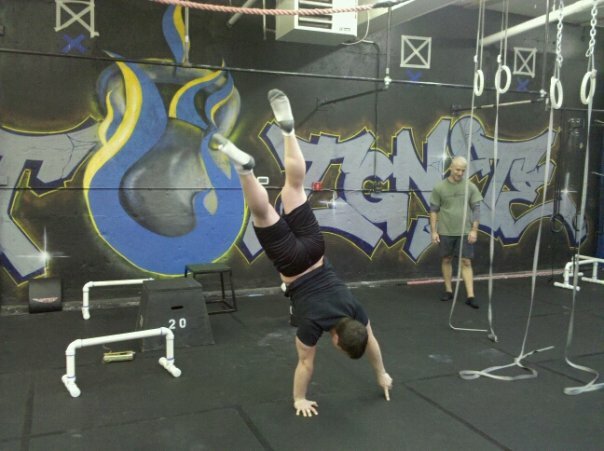 I thank everyone who went to a previous seminar to hear my thoughts on the one arm handstand. I am always constantly learning. Another photo from the week-long sailing trip. In my defense, I probably had a few drinks in me at this point. – Head is pulling back to the supporting arm. No good. – You can even more clearly see the shift in my hips/legs to my left side. They should be dropped more to my right side so it doesn’t look like I’m bending to the left. Pusser’s Rum does not make for a good workout supplement. – Supporting arm looks good. – Head is in normal position. – Hips are shifted only to the right – this is also good. – Free arm is giving a light finger assist. I’ve always really enjoyed this exercise, as it allows one to stay up longer and feel the position. I still use this exercise frequently, albeit with better alignment! – Legs should be opened to a full straddle before attempting to learn this narrow straddle or legs closed positions. – You can clearly see my arching over and to the side. I was able to feel the balance point while doing this, but ultimately it caused more problems then it fixed. Namely, I ‘spin’ out of the one arm handstand often. Looking stronger in the position and getting things better, but still short of some breakthroughs. 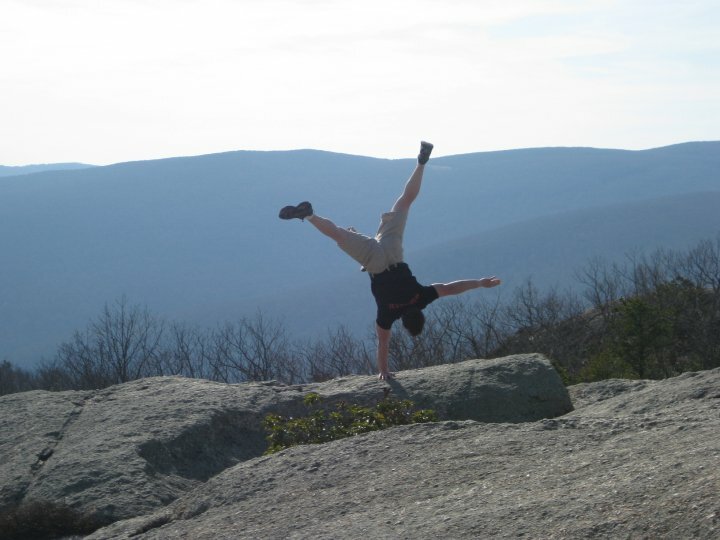 No better way to finish a beautiful hike up a mountain than by doing a handstand on top of that mountain. Held this one long enough that another group of hikers actually took a picture of it too! So that was cool. Getting better, but still problems. – Free arm – you know the issue. Probably still lifting it too fast. – Head and body – slightly leaned to the side, which is a better position for me. So that’s good. – Legs straddled as wide as my limited flexibility will allow. Good. – You can see that my right leg is twisting over (going toward the camera). This issue would continue to haunt me and spin me out of many a one arm handstand. Improvement, but I just felt I was holding the one arm handstand, and not really controlling it. Back to Jersey for another seminar. You should start to see trends in my form by now. – Head and body in decent alignment, but hips are slightly shifting to my right. – Free arm. Brought up for balance, but again whipping up the arm too fast will throw one’s balance off. – Narrow straddle is less forgiving than a wide straddle. Get those legs apart to start! – Still focusing on balancing my leaning forward and away (to my left). I can even see notes on the board describing this. Held but not controlled. Still not progressing on the one arm handstand, despite all the time put into it. 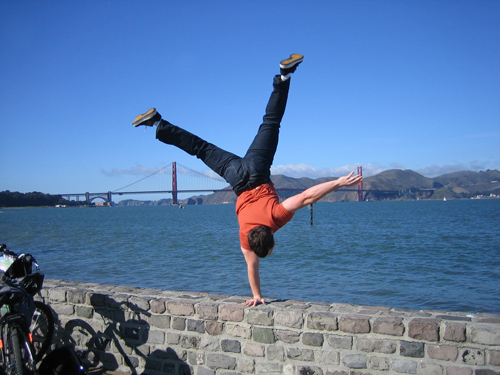 It was the start of 2011 when I realized that I needed to seek out professional teachers if I was ever to get better at the one arm handstand. First stop was the Philadelphia Circus School for an afternoon. My teacher, Lin, gave me pointers on improving my hand strength and training protocols for the one arm handstand. In this picture, I am shifting better to one side, but you can see that I am out of line. My shoulders are closed off a bit and my legs are arching over as a result. 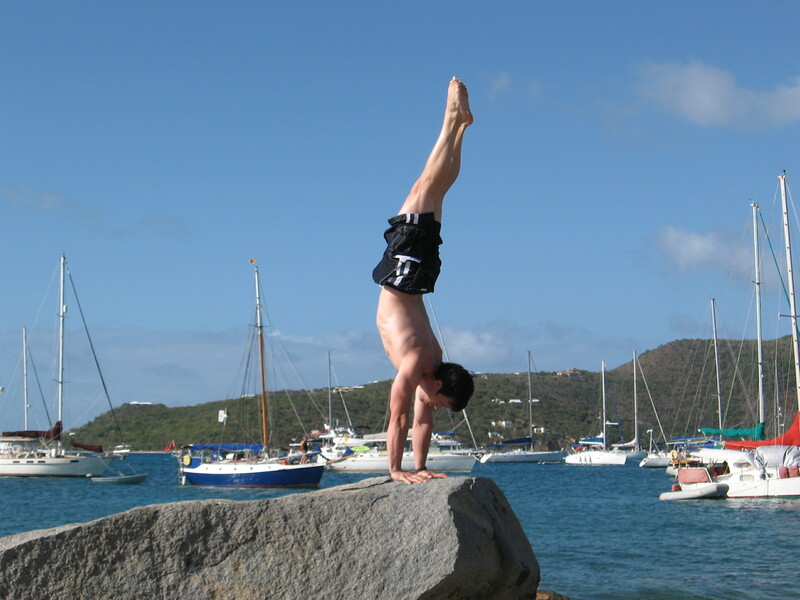 Take a look back at the Trellis Bay two arm handstand photo, now picture that same guy on one arm. While some can hold this arched one arm handstand…. …many more people will have problems and twist out of the one arm handstand (myself included). Not to mention that aesthetically speaking, it’s not as pleasant as a straighter body position. Progress in some regards. Only had a chance to work one afternoon with Lin though. The biggest thing though was that I turned to expert help for once. 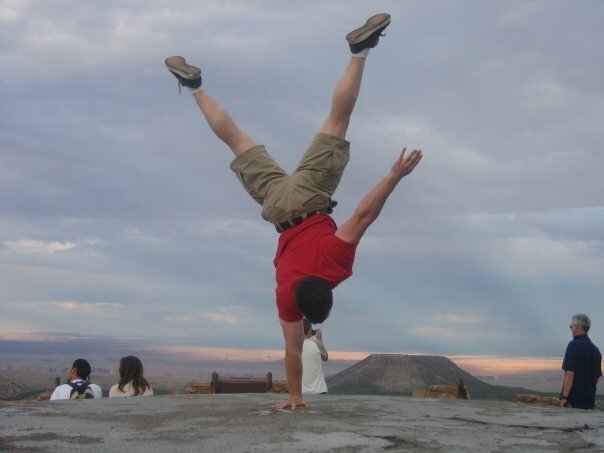 This one arm handstand is after only two month’s under the tutelage of Ido Portal. Ido is a tough coach and can often be an S.O.B., but he knows his stuff and I found his coaching extremely helpful. Much has improved – I am tighter throughout my whole body. I have better alignment in the body/hips/legs. Notice how there is no counter-shift to the left side, as you saw in previous photos (especially the 2009 British Virgin Islands shot). Arm could still probably be raised slowly and/or kept lower to the ground right now, but you should be able to see the huge differences between this OAHS and previous ones. This just looks better. Working on keeping the body in a line was also key at this stage in my development, and Ido had me practice up against the wall (CHEST facing) for many a day. Big steps in the summer of 2011. Searching out a knowledgeable teacher and being willing to PAY for their expertise (in both time and money) paid off dividends. 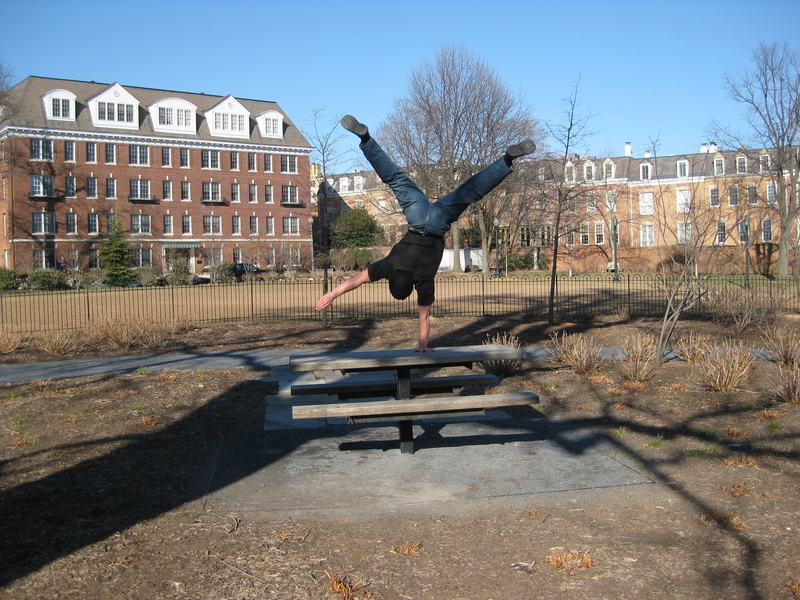 Another interesting note is that in May of 2011, I received an anonymous email regarding my one arm handstand technique. The sender had suggested I work with Ido Portal and Yuval Ayalon. So I did. The world works in mysterious ways. First off, this photo was taken in Washington DC at the National Arboretum. The columns behind me have an awesome history. If you’re ever in town, come on out and see this “hidden monument”. Anyway, it looks like I’m a bit twisted in this, but I’m looking much more consistent in my one arm handstand technique. I’ve stopped working with Ido by this point (just a 6 month coaching session). Things are going well enough, but the control in the one arm handstand is still touch and go. Every time I lift my free hand, I have to fight to stop myself from spinning on my supporting arm. It took my next teacher to show me what to do. Off to Mexico for a week-long trip (where I got subsequently got engaged!). This was just a few weeks after I first met Yuval Ayalon. He is a professional acrobat in Las Vegas for Le Reve, friend of Ido Portal, and one of the nicest guys you’ll ever meet. I traveled out to Las Vegas for a friend’s birthday party, had heard of Yuval before, and knew that I wanted to meet with him for a private session. I ended up flying into Los Angeles, and driving 5 straight hours to get to Yuval’s house at the last possible moment. Not ideal for training, but one pushes through anyhow! Yuval quite clearly showed me how lacking I was in shoulder mobility. I’ve shared this picture before, but here I am in his house with a dowel rod connected to a rubber tube. Ideally, the tubing should draw a nice straight line from hands to shoulders to hips to feet. You can see how much I need to improve. On a related note, at this time I was unable to lay in bed and put my arms over my head without my hands falling asleep. You’d think I would’ve realized that my shoulder mobility was terrible. Yuval gave me various drills for alignment and positioning. 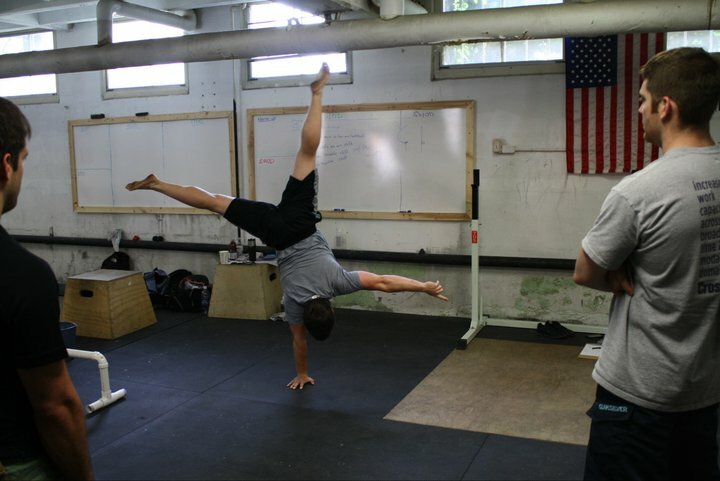 He gave me feedback over the next several months on my one arm handstand form. This was invaluable toward my progress. No one ever said it was going to be easy. But get these areas loosened up with soft tissue work. This could include massage, or something as simple as rolling the muscle out with a lacrosse ball. Learn proper stretches for them all. I am not going to make this a post on how to improve shoulder mobility, I just want to stress the importance of shoulder mobility in the one arm handstand. And I also want to stress that you must understand how the shoulder blades move around the body to understand how the shoulder moves. Yoga as Therapy – by Doug Keller – An excellent book that gives a very easy to understand explanation of how the shoulder blades and shoulders move. Anatomy Trains – by Thomas Myers – A fantastic book, but often heavy read. Doug Keller references this throughout his ‘yoga as therapy’ books. Pick this up if you want to delve further into the topics covered by Keller. This is a screenshot from this video. It’s been about 6 months since I first met Yuval, and progress is the best it has ever been. 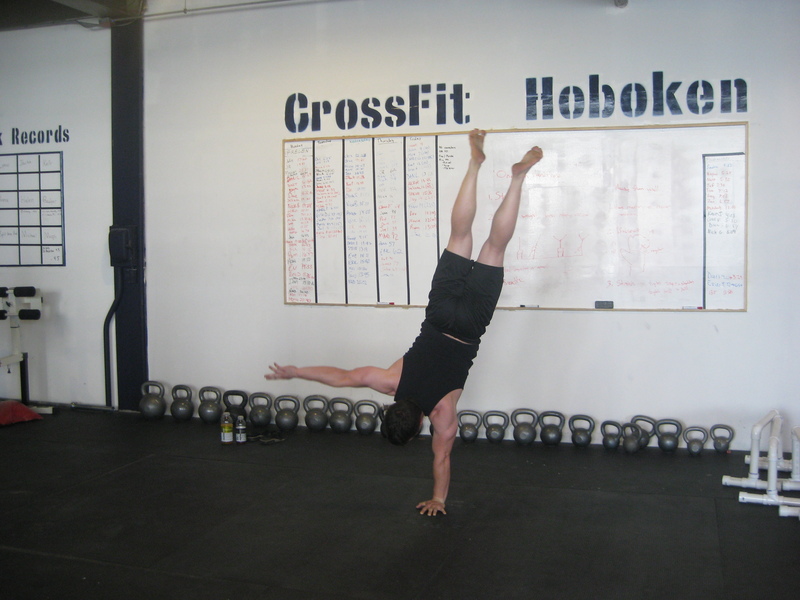 Increased mobility in the shoulders means that don’t spin out of my one arm handstand as easily. The legs are stretched out as wide as I can, and kept tight. When shifting onto the supporting arm, notice that I focus on dropping the outside leg (right leg in this case). There is no counter-shift back to the left (which twists the body). My supporting shoulder is engaged enough to steady me, but not pushed out to its end range. Just enough, no more. Notice in the video how I slowly lift my hand up. I keep my left forearm relaxed and hanging down to the ground. This has much less tendency to throw me off balance. Instead of focusing on shifting my weight over and out, I am focusing on keeping a good line. An important note as well, when finishing up a one arm handstand attempt – look to bring yourself back to the center! Do this under control! Getting into the habit of falling out of the one arm handstand will create bad habits. Holds of 3-5 seconds now common. Best progress yet. All the same things as the video above, just done against a wall. This is a good drill for getting use to the shift. 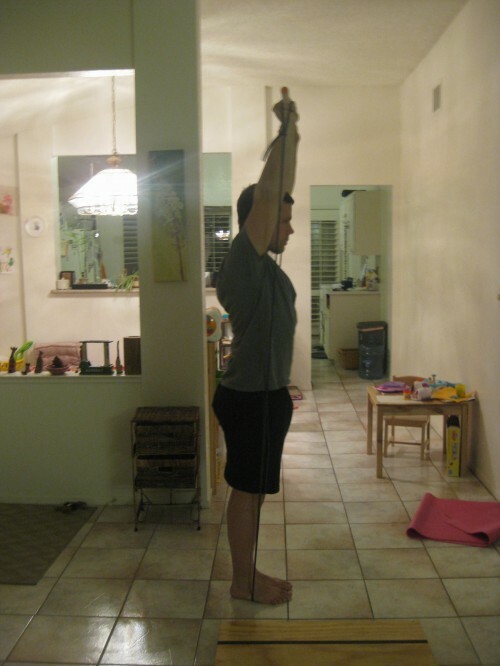 Notice that there is NO counter-shift with the hips to my right, as in previous one arm handstands. This is one of the most common issues that I see. Also notice the relaxation in my free arm. I am not whipping it up. Moving the arms and legs in a one arm handstand in various artistic positions will come in time, but make it easier on yourself to start! Move slow! Good consistency in technique now. This is a screenshot from this video. I’ll start by saying that one should shoot videos of their handstand from the back AND the side. One must be able to see all angles of the one arm handstand. The side shot, in particular, helps one see their line. In these side shots, I want you to see the alignment that I’m fighting for. Foot over hip over shoulder over hand. Also, keeping both feet in line with the body. If the top foot or bottom foot is out of line, then I’ll find myself twisting out of the one arm handstand in quick order. Continuing to improve my shoulder mobility will help with the ease that I can hold the one arm handstand and should increase the amount of time I can hold the skill. “Feeling” the one arm handstand better than ever. 5 second holds on a regular basis. This post wasn’t meant to be a step by step guide to the one arm handstand, although I hope you learned something. It was to show the mistakes and developments that one often has to go through in learning skills. If you do not enjoy the process of trying and failing repeatedly, then you will never progress. Tenacity is often more valuable than talent. 1. Seek out a qualified teacher as soon as you can. This can literally eliminate years of frustration. 2. Work on your shoulder mobility. 3. Move slowly into position. Do not be in a rush to lift your free hand. I still spent many practices just assisting myself with a few fingers from the other hand. A more detail tutorial may arise as I feel more comfortable with this skill, but for now I hope you enjoyed this 5+ year journey, I know I have! Wow, great writeup Jim, I enjoyed that very much. I’m still working on the regular od handstand. I didn’t become obsessed with it until recently at 47 years old. Got a long way to go before I’ll ever attempt working on the OAHS. Im honestly aching to know which shoulder mobility drills you did as I am having the same problem in my two arm handstands throwing my body out of alignment. It would be awesome if you included these drills in your upcoming tutorial or at least explain them to me. I worked a little bit on the one arm handstand without having the strength. Hurt my elbow and 2 years later it still hurts if I am not extremely careful with positioning. Xrays, MR etc. have not been able to identify the issue. Morale: Be careful. Great writeup Jim. You are going the mile and is a real inspiration. Brilliant, Jim and thank you for posting. Also glad to know it has been a difficult journey for you as well! I will post shoulder mobility drills in the future. Lots to talk about, check the further resources I posted in the meantime. What an inspiring article. Your perseverance in the one armed hand stand has given me a huge shot of encouragement to focus on improving my two-armed one. Thanks! 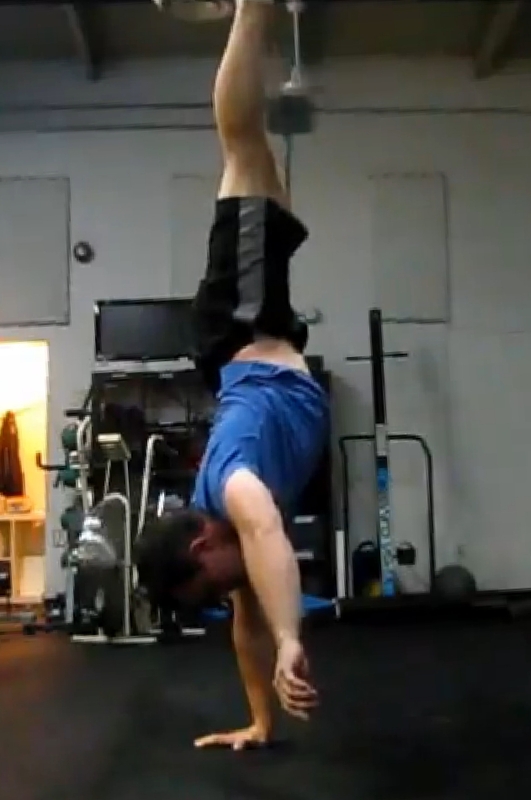 Still working on handstand here as well, but am also interested in improving shoulder mobility. What a journey. Thanks! This may be an obvious suggestion, but have you tried the twist hold exercise from Convict Conditioning 2? I know you did the modeling for the bridge and the L sit, as well as many other demonstrations in that book, but I noticed that Al Kavadlo did the twist hold. I use the entire ‘Trifecta’ on a nearly daily basis for mobility training, and I think the twist hold, in particular, has really helped my shoulder mobility. I would not doubt if you have already mastered this particular skill, but if not I think there’s a good chance that it could really help you out here. On the July 2012 photo, your lack of shoulder mobility is still apparent to me. With your head looking down, your back starts to arch ever so slightly from the neck, then you straighten it out at the lower back. This is not a drastic arch, but it does illustrate the limited shoulder angle that you are using. Oh, one other thing that you probably have already noticed (but I think is worth mentioning just in case), when doing a back bridge, if you strive to rotate your elbows inward, pointing them in the same direction that your face is facing, it seems to encourage further strength development with a fully open shoulder angle, and in working handstands concurrently, I have noticed that this slight adjustment in practicing the back bridge has helped to increase the support that I have going from my upper torso into my arms in the handstand. Like, the inner support structure connecting my arms into my shoulder has a better “grab” on my body. Perhaps this benefit can be seen even more by practicing the elbow-turned-in back bridge with only one arm and the opposite leg? I’m interested to get your thoughts on these exercises and how/if they help your one arm handstand training. If you do try this stuff out and find noticeable improvements, would you please e-mail me about your results? Hey I’ve been working on my oah for while now, and I have holds of 5 seconds half the time. My left hand, my strong one, get ssome pains in my palm. This is left side of my palm right under my thumb. got any exercises that will help with this? Wow! Very interesting article about your journey to a oahs! 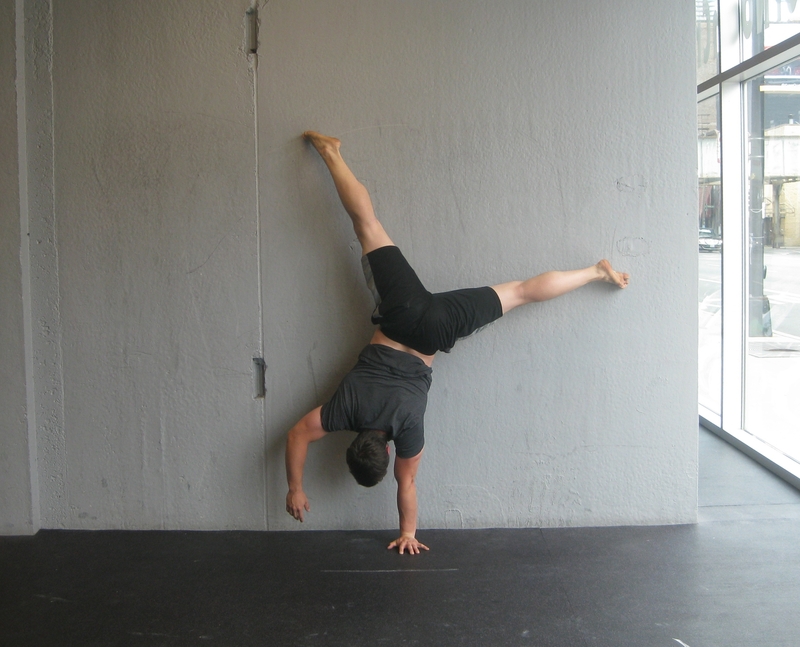 I started to practice regular handstands earlier that year and I’m still working with the support of a wall. I just did my first hs push ups last week and my final goal is to do hspu with one arm only (I know this will take years but every journey has to start some time). Nice to read your tips/experiences about this exercise! The one arm handstand will come! It just takes a lot of work!! One must never give up, and enjoy the learning! Next step is to learn to use the Force to levitate rocks. Control! You must learn control! Funny you mention that, I’ve got a pic on my instagram of me dressed as Luke Skywalker – doing a OAHS – with yoda on my foot!